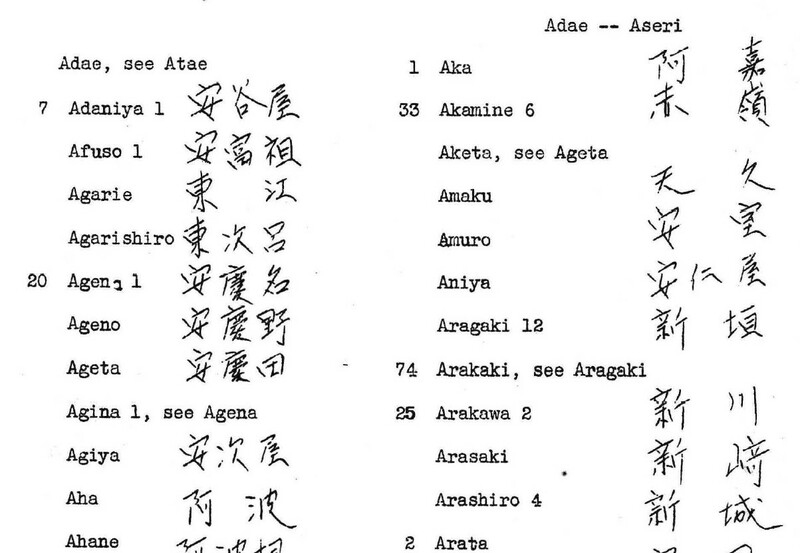 The basis of this list is from the Nippu Jiji Nekan, Honolulu, 1941, and contains the names and Japanese characters of all persons in this Directory who trace their ancestry back to the Okinawan Islands. Before each name is the number of adults listed who have this appelative. On this list from the Nippu Jiji are also indicated those with the same last names who were inducted into the U.S. Army in Honolulu in March, 1943. The numbers following the names refer to these A.J.A. voltmteers. The names which have no number either before or after them are from a list of Okinawan names collected by Inagaki Kunizaburo, a Japanese traveling in the Loo Choo Islands, and published in his Ryukyu Showa. The author listed those names “difficult and unusual” which are often found in the southern islands. Names are underlined which occur both among Okinawas[sic] and Naichijin, more especially those from Kyushu and from the guntos south of it. There are names in the list which are not underlined that are not exclusively Okinawan by sound, but the characters given with them show they are definitely from these southern islands. For the entire list, click the image of the front cover above, pages 7-17.